For those interested you can see why we will not be flying Spirit Airlines to next year's festival, click this link to furiocity.com. 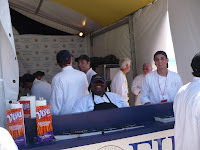 We were fortunate to count ourselves among the 35,000 attendees to the 8th Annual Food Network South Beach Wine and Food Festival. 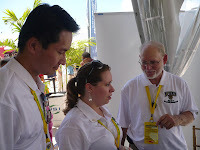 We participated in the Friday Trade Tasting and the Saturday General Tasting. There were hundreds of different types of wine, beer, and spirits to taste as well as cooking classes given by the Food Network’s personalities. Even though the festival runs over four days and nights – there is still not enough time to adequately attend each event. This year we once again chose to spend the majority of our time experiencing the amazing wines and spirits; and sadly we did not witness any of the cooking demonstrations. On Friday we allocated our time to tasting red wines from the United States and France and on Saturday, we spent the day tasting white wines, sparkling wine, and spirits. And as a disclaimer, we probably tasted only a third of the wines and spirits poured at the festival and those mentioned below are just a subset of the wines we enjoyed. And remember, in all cases - trust your own palate. One of the first wines we tasted was a new brand from Seven Daughters, their red and white blends. Each wine consists of 7 types of grapes, hence the name, and is marketing to the value consumers –the wine are priced near $15/bottle. The red is majority Merlot with smaller amounts of Cabernet Sauvignon, Cabernet Franc, Zinfandel, Syrah, Carignane, and Sangiovese. If you think this blend different, the white consists of Chardonnay, Symphony, Riesling, Orange Muscat, Sauvignon Blanc, Gewurztraminer, and French Colombard. These blends are rather unique. We followed that with a few more traditional wines and found great merlots and cabs from Beaulieu Vineyard, Sterling Vineyards, Bedell Cellars, and Trefethen Vineyards. At Sonoma’s Landmark Vineyards we discovered their 2004 Grand Detour Pinot Noir which was very similar to our favorite Oregon pinot, the 2006 Pinot Noir from Cubanisimo Vineyards. Our friends at Cubanisimo were also pouring an excellent rose and we listened to trade customers inform the Collada family how fast their wines fly off the shelf. Cubanisimo is also a favorite on the many cruise ships departing Fort Lauderdale and Miami. Of the Zinfandel wines we tasted the 2003 Geyserville from Ridge Vineyards (Santa Cruz) stood out. This wine is a blend of 76% zinfandel, 18% carignane, and 6% petite sirah. From Washington State we liked the 2002 Col Solare Red Blend made from Woodinville’s Col Solare Wines. This is a Bordeaux styled blend of Cabernet Sauvignon, Merlot and Petit Verdot had was both smooth with texture. Another Bordeaux-styled wine was poured by Walla Walla’s Spring Valley Vineyard, their 2003 Uriah. This wine is predominately merlot and is incredibly smooth and flavorful. Luckily a few Bordeaux wineries participated in the festival and two of the best were from Chateau Lascombes, their 2004 (50% Merlot, 40% Cabernet Sauvignon and 10% Petit Verdot) and 2005 (52% Cabernet Sauvignon, 45% Merlot, and 3% Petit Verdot). Both wines were amazing, but both in their own way. The 2004 was a lighter with more texture while the 2005 was fruitier and spicier. And winemaker, Dominique Befve, was present to inform us how this Margaux winery is becoming one of the regions top wine producers. From the Médoc region, we enjoyed the Chateau Greysac Medoc 2003 and the neighboring Château Larose-Trintaudon Haut-Médoc 2003. Both wines retail for less than $20 and show once again that there are affordable Bordeaux wines. You just got to find them. The final wine we’d like to note came from across and down the river, the Château Simard St. Emilion 1998. This wine is released after having aged 10 years in the bottle after fermenting in stainless steel. With this wine, you don’t need to wait to see how a wine ages, and at $30 you don’t pay for it. 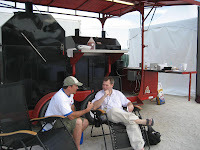 We left Friday’s tasting a little early in order to interview barbecue champion Chris Lilly – which is posted below. We started Saturday by tasting white wines and started with one I noticed the previous day, Maison Trimbach, a winery that has been making wines in Alsace since 1626. The French Alsace region is the home of excellent Riesling that the American public normally associates with Germany. We tasted their Gewurztraminer which is made dry with a slight spicy finish and the Riesling “Reserve” – a classic grand cru wine. Both wines are perfect beach wines. Napa’s Trefethen Vineyards also produces a good riesling, the 2006 Estate Dry Riesling. This wine is very refreshing with a citrus\ green apple flavor with a nice acidic finish. We found two very good chardonnays, the classic Grgich Hills Cellar Napa Valley Estate Grown and Oregon’s Domaine Drouhin’s 2006 Chardonnay Arthur. Both wines are crisp and fruity with slight hints of oak that give texture but not butter. We found a good Sauvignon Blanc with Mendocino’s Parducci Wine Cellars. Their 2006 Sauvignon Blanc has a lemon and pineapple flavor with a very refreshing acidic finish. A similar wine, and perhaps our favorite white, was the classic Bordeaux blend from Yountville’s Cosentino Winery and their 2006 Cosentino The Novelist. This wine is a blend of 80% Sauvignon Blanc and 20% Semillon that is partially fermented is French Oak barrels. This wine is similar to the other Sauvignon Blancs with citrus flavors and an acidic finish, but this wine has a stronger floral aroma and more texture and feeling. The wine is also reasonably priced at under $20. Of the sparkling wines we tasted two California wineries stood out. Napa Valley’s Mumm Napa was pouring two sparklers, their Blanc de Noirs and Brut Prestige. The rosé Blanc de Noirs is made primarily from Pinot Noir grapes where the grape’s skins are removed quickly to produce the pink color but retain the fruit flavor. The Brut Prestige is primarily Chardonnay and is much drier but with similar structure. Both are great value wines, priced below $20. Sonoma’s Gloria Ferrer Winery was also pouring their Blanc de Noirs as well as their 2000 Gloria Ferrer Royal Cuvée. The cuvee has a little more Chardonnay than the Blanc de Noirs and is aged 6 years on the yeast. We had an interesting conversation with two wine experts while drinking this sparkler that showed that even educated consumers have different tastes. One preferred the Cuvée whereas the other preferred the Spanish Segura Viudas - one was too carbonated – the other too one-dimensional and their exchange was worth videoing – maybe next time. Turning to spirits, one of the first we tried is one making a comeback in this country, absinthe, this one produced by Lucid. Absinthe was first commercialized in the early 1800's and is made from various herbs such as Green Anise and Sweet Fennel and the Grande Wormwood (Artemisia absinthium). This gives the liquor a black licorice taste. The spirit mixed with water poured over a sugar cube which accents the black licorice taste. Another favorite was the Voyant Chai Cream Liqueur Liquor, made from aged Virgin Island rum, Dutch cream, Black Tea from India, other spirits from Holland, and several Asian spices. This concoction is delicious over ice or used in as in ingredient in the Chai Coloda – basically the Chai Cream, Cream of Coconut and pineapple juice. This is the taste of South Beach. The next spirit was the Cachaça Moleca, think of cachaca as the Brazilian form of rum with a slight tequila flavor. Moleca produces two versions, a Silver which is used as a mixer (simply lime and sugar is our favorite) and the Gold sipping cachaca. The Gold is fabulous - aged three years in oak and extremely smooth with a slight wood flavor. This is as good as any expensive sipping rum and will be a regular at our home bar. Speaking of rum, we tried several excellent brands and four stand out. The Ron Barceló IMPERIAL has been made in the Dominican Republic since 1929 and is a smooth sipping rum. According to its literature, it was selected as “The Best Rum in the World” by the Beverage Institute of Chicago in both 2000 and 2001. It reached the highest qualification (97/100) never before awarded to a rum by the Institute, after calling it “a superb world-class drink”. Next was the Flor De Caña, a Nicaraguan rum made by the same family since 1937. Our two favorites were the 12 year old Centemario and the Limited Edition Centemario 21 – aged 15 years. One of the best is the Diplomático Reserva Exclusiva, from Venezuela. This dark brown rum has hints of vanilla and a slight toffee finish; and very smooth. Our favorite was Vizcaya, a Dominican Republic rum made from the Cuban tradition where the rum is produced directly from sugar cane juice, instead of converting the sugar first to molasses. The Cuban family responsible for Vizcaya has been making rum in Cuba since the early 1820’s but was forced out after Castro nationalized people’s assets. This rum is smooth and slightly sweet with honey flavors and a vanilla finish. 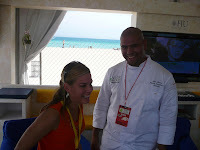 As you can see from our commentary – the Food Network South Beach Wine and Food Festival provides an excellent opportunity to sample extraordinary wines, spirits, and food. Next year we plan to spend a little more time in the cooking demonstrations and we thank Southern Wine & Spirits of Florida and Robin Insley Associates for giving as an opportunity to cover this event. And to see how much fun you can have next year, watch the video below. Update: We apologize for the lack of audio for the videos. We tried to imitate our good friend Dezel at My Virginia Vine Spot and interview attendees, but after reading the manual for our cheap digital camera, we learned that it does not record audio. Time for a new camera. Chris gave us some suggestions for pairing wine with barbecue and his most important point is to stay away from heavy smoky wines – i.e. wines that have been aged for a long period of time. The wood on wood flavor would basically overwhelm the palate and you would lose the characteristics of each. Instead, you could use a Rose, or a Pinot Noir, but the best choice is a wine with a semi-spicy finish, such as a Zinfandel or even a Gewurztraminer. I used this suggestion on Saturday by getting a plate of Bulldog Barbecue and pairing with Cubanisimo Vineyards 2006 Rose and 2006 Pinot Noir and then with Ridge Vineyard's Geyersville Proprietary Red (Zinfandel, Carignan, and Petite Sirah). Each wine enhanced the barbecue – with the Pinot influencing the meat and the Rose complementing the sauce – but I have to agree the Zinfandel brought out the best in the pork and the sauce. Chris Lilly, husband and father of three children, is one of America's best-known barbecue pit masters. Chris emerged on the barbecue scene in 1992 when he began working for the world famous Big Bob Gibson Bar-B-Q restaurant in Decatur, Alabama. Recognized by The Wall Street Journal as having the best pork barbecue in the country and named the "Best Barbecue Restaurant in Alabama" by the Birmingham News, Chris is now vice president of Big Bob Gibson Bar-B-Q. Chris also is head chef of the award-winning Big Bob Gibson Bar-B-Q Competition Cooking Team. He is the winner 10 World BBQ Championships including six Memphis in May World Titles (a.k.a. "The Super Bowl of Swine"), as well as the American Royal International Cook-Off and BBQ Sauce Competition (Best Sauce on the Planet), and eight state barbecue grand championships across the Southeast. Chris has also displayed his culinary talents abroad by capturing the Grand Championship at the 2003 International Jamaican Jerk Barbeque Cook-off. Widely recognized as one of the top pit masters in his field, Chris recently served as an honorary chef at the James Beard Foundation, American Institute of Wine and Food, and was a presenter at the Low-Country and Caribbean Food Conference at Johnson and Wales University. In an effort to educate America on the fundamentals of championship barbecue, Chris was the co-creator of “The All-Star BBQ Showdown” for The Outdoor Life Network (OLN). This 9 episode BBQ television series aired in 2005. Along with creating the show, Chris has also assumed the Executive Producer role and hosted the show. 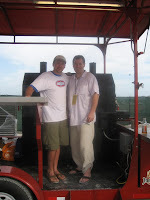 In 2006, Chris continued with his television career as co-creator and executive producer of BBQ Championship Series on Versus Network. 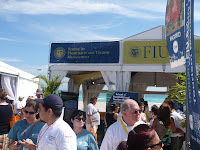 The major benefactor of the South Beach Food and Wine Festival is Florida International University’s School of Hospitality and Tourism Management. This is one of the country’s top hospitality management schools and attracts students from across the United States and over 90 countries. Graduates pursue careers in obvious choices such as restaurants and hotels, but also marketing, cruise lines, and even the wine industry. The school’s promise was in full display on Saturday as we met with student Alex Blanco, who planned FIU’s contribution to the festival. Alex entered FIU as an independent but quickly chose to major in the Bachelor of Science in Hospitality Management after learning about the school. He had been a member of the school’s participation at the Food & Wine Festival for the previous three years, but this year he took ownership of the operation by creating a menu, getting staff approval and coordinating its execution with the other students.This included procuring the food, the logistics of setting transporting and cooking the food, and even mundane problems as not having enough cups available on site. Saturday’s menu was venison served with cucumber-hummus on a pita. The farm raised – free range - venison was donated by Bush Brothers Provision Co., the local providers of Cervena New Zealand Venison. Throughout the day, a long line of attendees snaked their way to the kitchen – with the line moving rapidly as the students cooked and distributed the food. The venison was awesome, slightly pink and quite moist. The smooth operation was a testament to Mr. Blanco’s planning and the execution of the students. Well done. In addition to their culinary skills, the student’s wine and beer making talents were also on display. Many of the students take several types of wine classes, from appreciation to wine-making technology to wine and beverage management. As part of the curriculum, Professor Barry Gump was able to obtain Merlot juice from his friend, Clark Smith of WineSmith. Some of the merlot grape were crushed, pressed, and then frozen and used to make a White Merlot. The remaining juice was frozen and half was used for this year’s bottling of a semi-sweet Merlot and the rest is currently aging in American Oak to be opened during next year’s festival. The students used their wine-making skills to make the White Merlot dry but with a fruit forward aroma and flavor – in a White Zinfandel fashion. The wine is remarkably clear and refreshing with a slight acidic finish. The semi-sweet Merlot reminded me of some of the Hungarian reds made a little sweeter – but not overly so. The wine is fruity and could also be served chilled. Since the student's did not have time to age the wine, this semi-sweet red was a great choice. Professor Gump also feels this wine would be attractive to a Midwestern audience. The students at the School of Hospitality and Tourism Management are obviously gaining an enjoyable, yet practical education. Yesterday was the trade tasting and it was quite an event. There was outstanding wine being poured from the West Coast (California, Oregon, & Washington) as well as from France, Italy, and the Americas. I did not get a chance to try wines from Australia, New Zealand, or South Africa - but will try to today. There was also a pleasant surprise to see Long Island's Bedell Cellars pouring their excellent Merlot and local Schnebly Winery pouring their tropical fruit wines. More than wine was poured however, as we were able to taste awesome rum, cachaca, and even Lucid's Absinthe. Then there's the vibrant South Beach nightlife - where we saw a great flamengo duo. Check MyJoog for details. In the coming days I will post about our favorite reds, whites, and spirits as well as our interview with the Food Network's barbecue king Chris Lilly. We at Wine-Compass.com have never been steady chardonnay drinkers, nothing to do with the grape, its just that there are so many other varietals to try. However, that may change once we opened a bottle of Trevor Jones Virgin Chardonnay on a suggestion from our friends at Out of Site Wines. The wine starts with a peach aroma and flavor and followed by a refreshing slightly acidic finish. What makes the wine special is that even though it is unoaked, it has more texture and complexity than many oaked versions. This is the type of wine where you take one sip and say "Wow". And the wine won't bust your wine budget since it retails for less than $20. We look forward to researching the Trevor Jones brand and other wines from Kellermeister Winery. A quick review of their website shows a large selection of award winning wines; from their Riesling and Frontignac to Sparkling Wines and Ports. We learned yesterday that we have received press passes for the South Beach Wine and Food Festival, held of course, in sunny South Beach Florida. In the coming weeks we will be posting articles about the students at Florida International University’s School of Hospitality and Tourism Management - on whose behalf the festival is sponsored. This year the students have produced two wines (a rose and a white merlot) to pour in the general tasting on Saturday February 23rd and Sunday February 24th. If you plan to attend, please stop by their booth and please let us know - we plan to interview people to get their impression of the student's wines. There will also be wines and spirits poured from some of the best wineries in Europe, California, Australia, and South America - so we will post our thoughts of these wines as well. From somewhere a bottle of Burford and Brown's, 2006 Lady Grace Verdelho appeared in our wine refrigerator - how, I do not know. The wine's pale appearance almost dissuaded us from opening it - think cheap pinot grigio. However, curiosity overcame our skeptical attitude and once again we found that looks can be deceiving. It's nose is floral and the flavor, somewhat like apricots. You can also feel the wine's complexity as it moves off the tongue and throughout the mouth. With a nice balanced acidity - this wine is a refreshing libation alone or with a meal. Having heard of Verdelho, but never really researching the grape, I found that it originated in the Portuguese island of Madeira and is also grown in the Douro valley to make "white" Port. It is also grown in some regions in Spain and Argentina, but its greatest success outside Portugal has been in Australia. Peter Burford brought his knowledge of the grape from Australia when he was hired winemaker at California's Alexander Valley Vineyards. In 2001 he started Burford and Brown with a colleague from Alexander Valley Vineyards, Adam Brown, whom he has since bought out. The 2005 Lady Grace Verdelho was his first vintage verdelho, the "Lady Grace" to honor his mother. Burford and Brown is now the largest producer of Verdelho in the United States, so look forward to many future releases. The 2007 Verdelho will be released shortly and is priced at only $10. What a bargain. The first day at the Blogger's Corner has ended and its been an interesting experience. On the plus side I was able to meet a couple new wine\food bloggers (The Food Scribe and The Humble Gourmand) and witness the Dezel's popularity with the wine public. Dezel's Virgina Wine Spot also has more interactive interpretation of the Showcase than my postings. I was also able to taste wines from several new wineries. I discussed Acorn Hill Winery earlier and I was able to visit with Mattaponi Winery. They have a very interesting Pinot Blanc and several fruit wines - try the peach and strawberry. I also liked the Conundrum and Rosé from Vault Field Vineyards. On the downside, it was difficult to visit the tasting booths while your laptop and belongings were sitting out in the open. With a limited amount of time and fighting the large lines, I was only able to visit a few of the wineries I'd anticipated. For instance, at Vino Curioso, I was only able to taste their Chardonnay - as a constant flow of customers interrupted my tasting by purchasing wine. Imagine that - evidently a very popular winery. I also couldn't get near Breaux Vineyards or Hillsborough Vineyards and didn't even attempt to get close to Fox Meadow Vineyards. The final disappointment - at least as a consumer - is sticker shock with the higher price of Virginia wines. The average list price now seems to be over $20/bottle. Whereas some bottles are definitely worth that price, others are not. And with the 2007 vintage that many winemakers anticipate will finally put Virginia on the wine map - look for even higher prices to come. If I return Sunday, my goal will be to select the best value red and white Virginia wine. Plus, my laptop will stay in the car. The bloggers decided to share a bottle of wine since it was getting crowded at the tables and we selected Cooper Vineyards Petit Verdot - which won a Gold medal at the 2007 VA Governors Cup. This wine is a blend of 80% Petit Verdot, 10% Merlot and 10% Cabernet Sauvignon; it has a full berry flavor and a slightly spicy, but smooth finish. April, The Food Scribe, found samples of cheddar cheese that was a perfect match. She gained instant credibility in our eyes. I just took a short dry red run and tasted some very interesting wines. My first stop was Davis Valley Winery and Vineyard to try their Corot Noir a new grape developed at Cornell's New York State Agricultural Experiment Station in Geneva, N.Y. In fact Davis Valley is one of the first wineries to make wine from this grape - a cross between Seyve Villard and Steuben that is more suitable for growers in cold climates. The Davis Valley's version has a cherry aroma with a smooth berry flavor. While not as structured as Pinot Noir, the wine is very similar. I plan to bring a few bottles home for a more in depth analysis. I also tried the red selections from Acorn Hill Winery, which plans to open this spring in Madison. Today they are pouring their 2006 Merlot and Cabernet Franc. The Merlot is full bodied and smooth and for some reason I preferred it over the Cabernet Franc. Go figure. Finally, I was able to taste the red wine's from my wife's favorite winery, Savoy Lee Winery. I tried their Merlot and Cabernet Franc, which weren't bad- I think I'm becoming a Merlot lover, but my favorite was the 2004 Echo Forest Red, a smooth cab blend. After a brief network hiccup, Dezel from My Virginia Vine Spot and I are finally online at the Virginia Wine Showcase's Bloggers Corner. Throughout the day we will be posting highlights of the showcase and the wines. There are a number of Virginia wineries that traveled a great distance to be here including Davis Valley Winery and Vineyard, Hill Top Berry Farm & Winery, Peaks of Otter Winery, and Savoy Lee Winery to name a few. The Bloggers Corner is situated right next to James River Cellars and Bluemont Vineyards so we should get good sample of their offerings. We are also looking forward to tasting a few new wines such as Cooper Vineyards Petit Verdot and Davis Valley Winery and Vineyard's Corot Noir. This is also a chance to taste the wines from Virginia's newer wineries, Acorn Hill Winery, Mattaponi Winery and Vault Field Vineyards. I'll be back shortly. This Saturday, the 9th, I will be joining Dezel from the Virginia Vine Spot at the Virginia Wine Showcase at the Dulles Expo Center in Chantilly, Virginia. The sponsors are creating a Virginia Bloggers table where we will be "blogging" about the festival and Virginia wines. Please stop by and say hello. The Expo is open from 11am-5pm Saturday and Sunday. The cost is $25 online or $35 at door. "Enjoy unlimited tastings of Virginia’s award-winning wines all in one comfortable, indoor location. Become a wine aficionado in pairing and tasting seminars for both the novice and the connoisseur. Stock your cellar with hard-to-find artisan wines and shop ‘til you drop for the best art, craft and gourmet offerings in the region at this fabulous mid-winter showcase - just in time for Valentines Day!" Our brethren in the beer industry are facing a crisis due to shortages of hops and barley. Several factors lead to this development: rotation to higher margin crops, increased beer consumption in China, real estate speculation, the weather (drought in Australia and storms in Europe), and government subsidies for bio-fuels and ethanol. Demand for ethanol has doubled the price of corn and farmers have switched to rapeseed and canola as the government subsidizes biofuels - so why grow barley. In fact, very few in the Federal government will acknowledge that their search for the ethanol Holy Grail has negatively affected other farm products - expect your dairy and beef prices to rise as well. As a result of these factors brewers either can not find substantial supplies of barley or hops or can not find the specific type of hops they prefer. When they do find a hops supplier, the price is between 300 to 400% higher than last year. Many craft brewers have had to suspend brands such as our favorite Tuppers' Hop Packet Ale and New River Pale Ale. In other instances, breweries have closed and consolidated. In theory, the higher prices of hops and barley should induce farmers to switch back to these crops. In the meantime, expect a smaller variety of craft beers this year - at a higher price.